Major General Luis Fernando Navarro Jiménez was born on November 4, 1960, in the municipality of Chía, in the department of Cundinamarca, in the home formed by Luis Ernesto Navarro Moreno (R.I.P.) and Mrs. Elismely Jiménez de Navarro. He finished his secondary studies and graduated from the departmental school José Joaquín Casas. He entered the Military School of Cadets 'General José María Córdova' in January 1980, where he finished his studies of Military Sciences, and graduated as a second lieutenant of the Infantry on December 1, 1982. During the course of his military career, he has taken military training courses to grow to different degrees and specializations such as: Skydiving, Head of Jump, Lancero and Special Ground Commando. He has General Staff diploma; he followed the program in High Business Management, in the Business School, Universidad de la Sabana; he has a Diploma in Business Administration from the Catholic University of Chile; a Diploma in Strategy, Innovation and Foresight, from the Universidad Externado de Colombia, and Master in Security and National Defense. In the same way, he is military professor in Military Sciences and Strategy, he has been a guest lecturer in several institutions, such as the War College of France, the War School of Spain and he has participated in conferences as a panelist in the framework of hemispheric cooperation with the Southern Command and the Pacific Command of the United States. His military career has grown in infantry combat units and training of Army officers and NCOs, including: Second Commander of Infantry Battalion No. 35 'Heroes del Güepí', inspector of studies and second commander of the Infantry School, Commander of the Airborne Infantry Battalion No. 28 'Colombia', Commander of the Cadet Battalion No. 3, academic vice-rector of the Military School of Cadets and professor of the War College. He has served as second commander of the Eighteenth Brigade, director of the Military Education Center, commander of the Rapid Deployment Force, Commander of the Joint Task Force Omega and commander of the Joint Special Operations Command. In the rank of Colonel he led the diplomatic representation of the Army as a military, naval and air attaché in the Republic of Chile and he was director of Comprehensive Action of the Army. 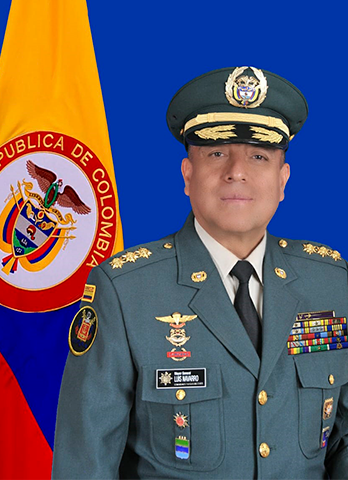 He was serving as second commander of the National Army, and, by appointment of President Ivan Duque Márquez, on December 10, 2018, he became General Commander of the Colombian Military Forces. He has been decorated with the Distinguished Services Medal, Grand Official category, by the Ministry of National Defense; Order of Boyacá, Grand Officer; Order of Military Merit Antonio Nariño, Grand Officer; Military Merit Order 'General José María Córdova', in the category of Grand Officer; Medal of Distinguished Services in Law and order, four times; the Faith in the Cause Medal; the Battle of Ayacucho Medal; the Medal of Distinguished Services of the Military Forces; the Military Medal Campaña del Sur and the Medal of Special Services for Special Operations and the medal of the Special Operations Command of the United States. Major General Luis Fernando Navarro Jiménez has a home with Mrs. Mónica Tovar Osorio, and his children Juanita, Luis Felipe, Mónica María and María Fernanda.